I recently realized that I had been building up a surplus of Legend of Zelda titles on my 3DS, so I decided to actually play whichever one you all voted for. The Legend of Zelda: Minish Cap proved victorious, and I was pretty happy about that because it was the only one on the list I had never played before. I start up and the game and the first thing that throws me off is Capcom’s logo. What? Nintendo let Capcom have control over one of their prized franchises? Turns out, Oracle of Ages and Oracle of Seasons were also developed by Capcom, and thankfully they didn’t mess up the formula of what makes a Zelda game a Zelda game. 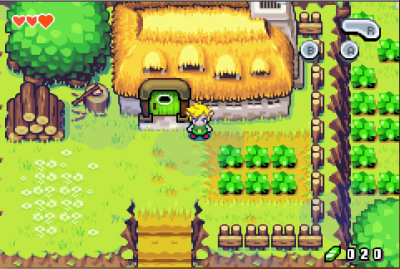 If you’ve played a 2D Legend of Zelda game you will know what to expect from Minish Cap. It’s a classic top-down affair with dungeons rife with puzzles, loads of equipment, and just about everything else you have come to love from Zelda games. However, there are some tweaks that make Link a little more efficient. For example, he can cut down multiple bushes with one sword swing. This might not seem like a big deal, but if you go back and try to play Link’s Awakening afterward you will miss that small luxury. Want to fight Ganon? TOO BAD. 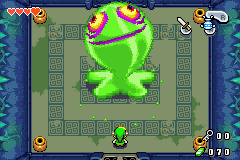 Minish Cap revolves around a much lesser known villain; Vaati. Vaati is a sorcerer who strolls into Hyrule and turns Princess Zelda into stone. Naturally, it is up to Link to save her and prevent Vaati from collecting a power known as the Light Force. Obviously this is a job for a child and not the king’s own guards. Kids have it rough in Hyrule. Along the way Link meets up with a race of tiny elf-mouse looking creatures called the Picori (also known as the Minish to all the ignorant Hylians) and a talking hat that can shrink him down to Picori size if he stands on a tree stump, upside-down pot, or somewhere else where he can draw as much attention to himself as possible. With the help of the Picori and the talking hat, Link sets out to four dungeons to find the four elements so he can infuse them into his sword and defeat Vaati before it’s too late. In other words, every Zelda story ever. Every Zelda title has some outstanding quirk, and this one is the talking hat that can make you tiny. Along with all of the tools you get, shrinking and growing are also parts of the puzzles you will be solving in the various dungeons you visit. These puzzles are mostly handled well, but every now and then I felt like the game didn’t give me enough to go on, so there were times when I would just run around completing side quests hoping I would run into what I was supposed to do next. 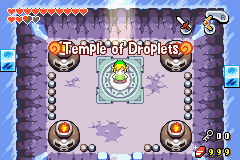 However, once I did get to the dungeons, I had a lot of fun figuring them out… except the Water Temple. The Water Temple stinks. No! Say it ain’t so! Speaking of side quests, there is other stuff to do in Minish Cap besides the four dungeons. If you want to put off saving Zelda for a while you can go out collecting things called Kinstones. Villagers and other NPCs will have half of a Kinstone, and when you have a half that fits it something happens in the world. A door will open, or a treasure chest will appear, and it is up to you to travel to where it appeared to find out what it is. The treasures can range from some rupees, to a Piece of Heart, and sometimes it’s just another fairy fountain. I found the whole process to be very entertaining, except when the prize was another Kinstone piece. Then it just made it seem like a vicious circle of never ending side quests. There are a TON of people to match Kinstones with, and I think I finished just about half of them when I beat the game, and collected even less of the spoils because I’m not going ALL the way out to Lake Hylia for 100 rupees. Make it appear a couple screens down and then we’ll talk. Minish Cap is a very vibrant and colorful game. Oftentimes it gives nods to previous Zelda titles. 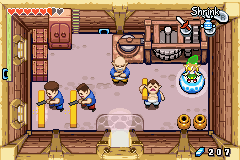 Link’s house in Minish Cap looks eerily similar to the one from A Link to the Past, and there are a number of characters you will no doubt recognize from Ocarina of Time. Even the mysterious shells from Link’s Awakening make an appearance. Some of the new tools are also clever and fun to use. The Mole Mitts and Roc’s Cape let you dig and jump to get to new areas, and the Cane of Pacci lets you flip stuff over. That doesn’t sound so exciting, but it is actually quite useful. The soundtrack is a wonderful mix of new music and familiar music. Like the graphics, the sound takes you back to previous Zelda titles in an awesome way. My personal favorite was the use of the Hyrule Castle theme from A Link to the Past. While a little shorter than most Zelda titles, Minish Cap is a very entertaining game. The shrinking aspect of the game throws in a whole new element of problem solving, and the Kinstone side quests will keep you curious and interested if you don’t want to blow through the dungeons super quick. If you Ambassador Program people haven’t gotten around to it yet, do yourself a favor and play through it. If you don’t have a 3DS with the Ambassador Certificate, pick it up for the Gameboy Advance if you happen to see it. This time it’s four shooting games and Dead Rising because I don’t have a fifth shooting game that’s not super co-op heavy. The voting has ended and the winner is Spec Ops: The Line.